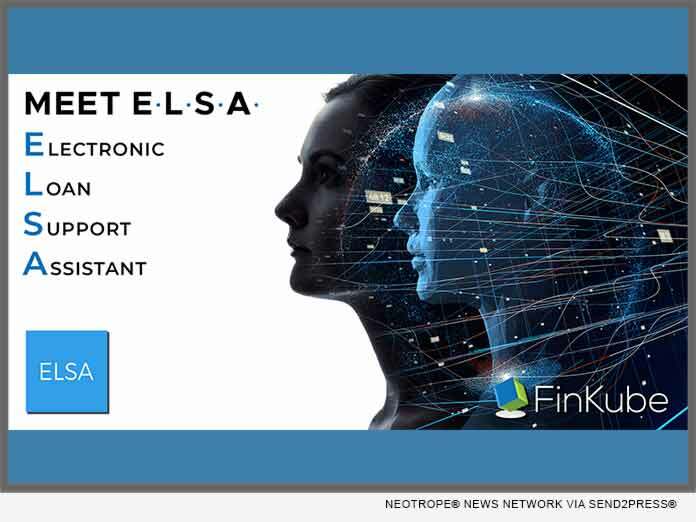 (DALLAS, Texas) — NEWS: FinKube, a company that provides AI-powered Platform-as-a-Service solutions for a range of industries, announced today that St. Louis-based LenderCity has successfully deployed ELSA, FinKube’s Electronic Loan Services Assistant. The mortgage industry’s first chatbot is already interacting with prospective borrowers on the LenderCity website. ELSA is the industry’s first intelligent assistant and uses AI and machine learning to enhance the origination process from origination to close. Her AI is powerful enough to gather borrower information, render decisions, automate time-consuming tasks and help lenders produce fully compliant mortgage loans in as few as 20 days, though she is well versed in any form of consumer lending. As an A.I.-powered virtual assistant, ELSA works 24/7/365 pre-qualifying leads, communicating with customers and synchronizing outreach across chat, text, voice, email, and mobile wallet. In addition, FinKube can deploy ELSA ten times faster than generic chatbots that can’t speak mortgage out of the box. FinKube with ELSA (E-Loan Support Assistance) is a human in the loop automation (IA) cloud lending platform that makes offering the digital mortgage experience easy. Adaptive technology with the only AI-powered cognitive, industry-specific chatbot all built on a private cloud infrastructure gives lenders affordable access to industry-leading tools that allow them to compete with the nation’s largest lenders. ELSA learns and adjusts to any origination model, chats with consumers to gather information and provide services, and provides lenders with the industry’s most flexible solution to meet their own lending needs. In short, FinKube offers Adaptive technology with the Cognitive functionality required to take lenders Digital. For more information, visit the company’s website at: https://finkube.com/.